Though dogs may be man’s best friend, they may not always be your yard’s best friend, and vice versa. In order to keep your pets happy and thriving in your yard, and to keep your yard happy and thriving around your pets, here are some pet-friendly principles that you can incorporate into your Warwick, NY landscaping. Adventurous pups will love exploring your new landscape design as much as you’ll enjoy seeing it come together. If you’re a dog lover, you’ll want to make sure your landscape is as dog-friendly as possible. Landscaping is about function - just as much as its about style. And similarly, there's no reason to sacrifice style for the essentials. Get rid of the boring water bowls and welcome something beautiful and integrated in your overall landscape design. Here are some stunning ideas for keeping your dog hydrated, in style! Keep your dog happy in your new outdoor living space. When designing a new outdoor living space, the kids, the in-laws, the big parties, and even the cold evenings are often considered. Making sure there's plenty of room to relax, that it's easy to access the necessities (e.g. proximity of the outdoor kitchen to sitting areas), and the kids safety find their way to the top of the list. And since the dogs are family members too, it's just as important to think of how they’ll be enjoying the landscape as well. 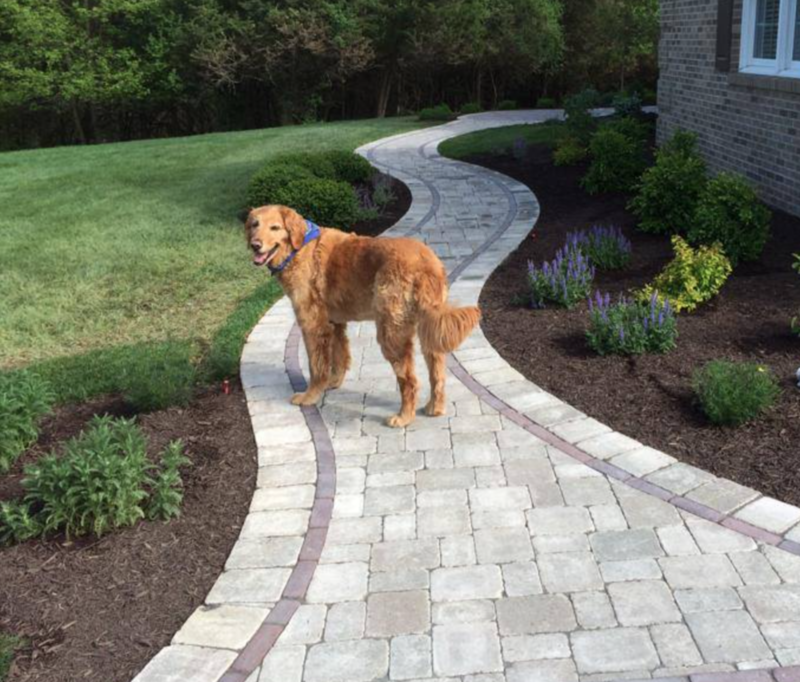 The sooner you think through all the extra details that will make the little four-legged friends comfy, the more that your landscaping professional can ensure that all of the pieces work well together in the overall design. To get your inspiration going, here are 5 important things to consider when creating animal-friendly outdoor living spaces for your Orange County, NY home. SHADE. Just like their humans, dogs love and need shady areas for rest. Consider a doggy house (maybe even multiple levels) to match the rest of your landscape design. Or perhaps areas of the patio that will always provide an opportunity for a break from the sun. Don’t forget that some pavers and stone can become extremely hot on the particularly sunny days; make sure to provide alternative walking paths for those moments. WATER. Water fountains with a pump and filter are perfect for providing never-ending clean water for your pet. Place these in discreet areas for dedicated water source for your doggies or use them as integrated design elements that complement or stand out on their own. By integrating, you get the opportunity for double benefits - relaxing water feature for yourself and other humans as well as potentially multiple options for water for your pet. Keep in mind that many dogs can’t swim and even those that can should always be provided a safe way out in case of danger. Enabling access to only shallow water and discouraging access to deeper water areas is best. WANDERING PATHS. Dogs love to roam and explore. Provide fun areas for discovery by creating paths within the space or even all around (a kind of dedicated dog walk area). The paths can also serve as fun exploration areas for children (if safety needs are met - such as avoiding small rocks). Add some benches, great scents from plants like lavender, and you’ll also have the perfect adult paths that allow for meditation and escape. LAWN. All dogs must run! Provide enclosed and large (if possible) spaces for them to go wild. Depending on the breed of your dog(s), some might use this space a lot more than others to get all of their energy out. To help make sure that the rest of your family can enjoy the fury animal members, ensure the running space is near adult-friendly features such as your outdoor kitchen or a children’s swingset. SAFETY. Some dogs can be happily trained to stay within an area - and others can’t. You know your happy dog best, be sure to incorporate a fence into your design, if its necessary. There’s more to keeping dogs safe - such as avoiding the use of some plants (e.g. lilies - ask your vet for more info) and protecting your animal from other animals. Think through what dangers your dog might be put in with a new design—and which ones currently exist—and face them head on in your conversations with your landscape design/build company.